The fresh fall air feels nice when spending time outdoors. 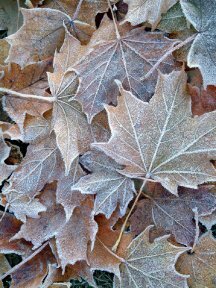 However, as the temperatures get cooler, we need to consider the possibilities of frost and the effects it will have in our gardens and landscape. With the changeable weather our area receives, it is hard to know when the first frost will arrive. Now is the time to keep a close eye on the local weather forecasts and be prepared to take measures to protect tender garden and landscape plants. If you have not yet moved your houseplants in for winter, you should do so now. Tender plants will not likely survive through a light frost with temperatures from 29° to 32° Fahrenheit. Plants that need to be protected when predictions call for these temperatures include summer annuals and warm season vegetables such as pepper, eggplant, and tomato. 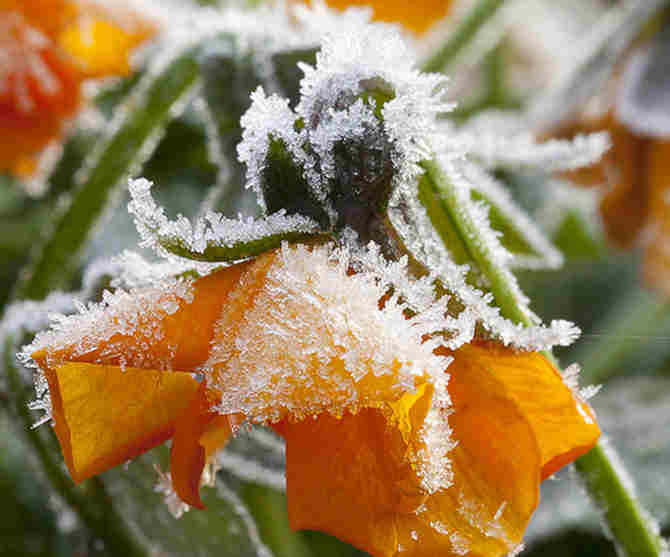 Mums and pansies, and cool season plants such as broccoli, lettuce and mustards, can tolerate these light frost temperatures and there is little destructive effect on other vegetation. If Moderate Frost with temperatures from 25° to 28° Fahrenheit is predicted, widespread damage will occur to many plants, with severity increasing the longer temperatures stay this chilly. Temperatures at 24 degrees Fahrenheit and lower can damage all plants that have not been acclimated to the cold. The colorful autumn foliage display that is common for our area can also be affected by temperatures this low. Now is the time to bring all house plants and tropical plants inside for winter. Even the roots of potted plants are susceptible since they are unprotected. If you cannot move all your potted plants indoors or to protected areas, wrap the pot with cloth or burlap or bury the pot in the soil as well as covering the foliage. Cover plantings of annuals (and other plants with blooms or foliage that you wish to save) with a protective layer before dusk. By the time it gets dark, much of the stored heat in the garden has already been lost. Sheets and blankets work well for this. Cardboard boxes, paper bags, buckets and newspaper will also work well. DO NOT USE PLASTIC COVERINGS. Plastic attracts the cold and may harm plants. Use support stakes under blankets or heavy cloth to protect young growth from being broken by the weight of the cover. You may need to secure lightweight coverings on the ground with blocks or rocks. For taller plants, you may be able to tie the coverings on or clip them with clothespins. Remove the coverings in the morning, once the frost has thawed, to let the light and fresh air back in, and to prevent overheating from the sun. If you have any concerns or questions, feel free to contact us.